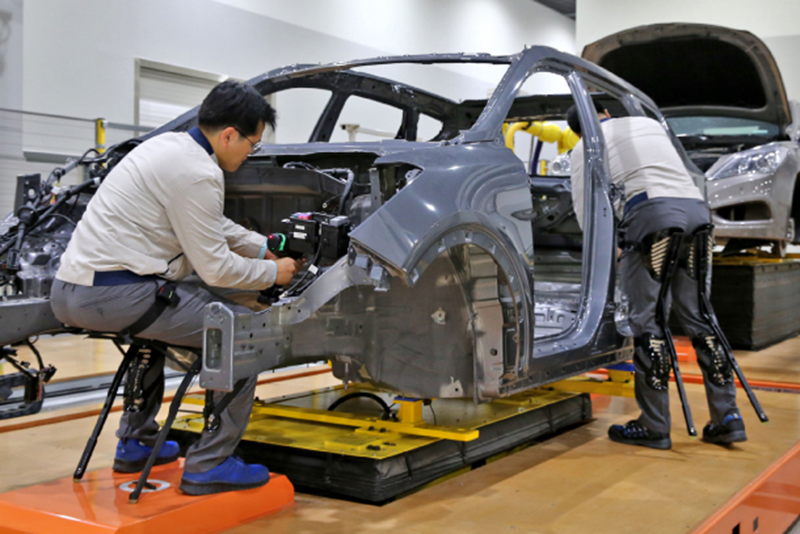 Hyundai Motor Group announced it was testing out exoskeletons on its North American plants to help workers lessen safety risks and increase productivity, as the company works to make robotics a major source of revenue. Since last month, Hyundai has been testing the Hyundai Chairless Exoskeleton (H-CEX) at a factory in North America. The H-CEX is aimed workers who have to stay in a seated position throughout the day. The carmaker said, by the end of this year, it’ll introduce the Hyundai Vest Exoskeleton (H-VEX) at the same facility. The H-CEX, the company’s first industrial wearable robot, weighs 1.6 kg but is endurable enough to buttress a body weight of up to 150kg. The H-CEX decreases the use of waist and lower body muscles by 80%, reducing the fatigue that results from being in the same seated position for an extended period of time, the carmaker said in statement. The soon-to-be introduced H-VEX exoskeleton is designed for workers in jobs that require a lot of arm lifting. The workers’ upper body will be supported by the exoskeleton, which will also protect neck and shoulder muscles. In early 2018, Hyundai Motor Group identified Robot-Artificial Intelligence as one of five areas of future innovation and growth. The company, which is South Korea’s largest automaker, formed a designated robotics team in its headquarters to focus on the development of similar technology, and is expanding its helping hand with related sectors. The company said it is developing technology in three areas of robotics: wearable robots, service robots, and micro-mobility. It is also working alongside other companies at home and abroad which possess robotic and AI technology. Hyundai is also preparing to test a hotel robot capable of guiding guests and providing room service. It will be introduced at the Haevichi Hotel & Resort on Jeju Island and at the Rolling Hills Hotel in Hwaseong, Gyeonggi, at the end of this year, reports Korea Joongang Daily. By early next year, the company will prototype a car-selling robot with natural language conversation capabilities and artificial intelligence. By 2020, Hyundai plans to introduce a robot that can charge electric vehicles at charging stations on its own.